Like most avid travelers, seeing the iconic white-washed buildings of Mykonos was something high on my bucket list for as long as I can remember. 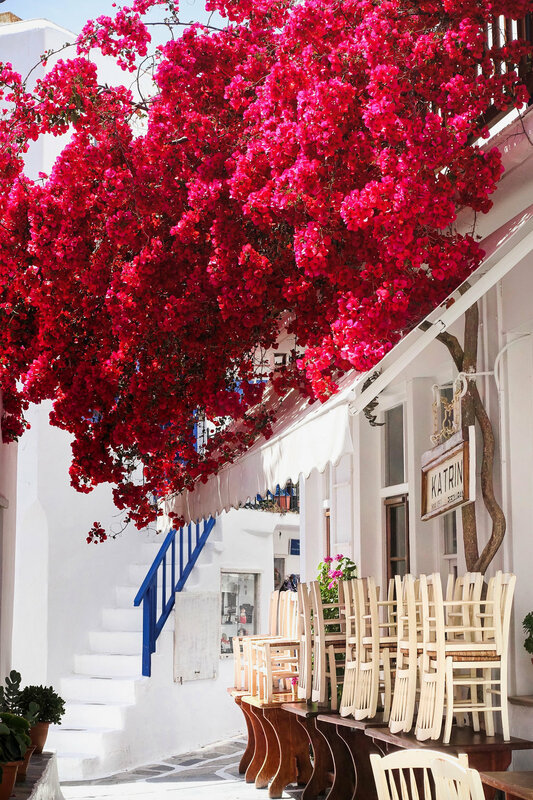 I dreamed of the days where I could frolic through the bougainvillea adorned streets and immerse myself in the Greek culture and island lifestyle. Seeing the bright blue balconies adjacent to the stark white buildings, catching a whiff of the flaming saganaki while I sip my wine, feeling the Mediterranean breeze in my hair while I stare at those famous 16th-century windmills... It was time to make that dream a reality! 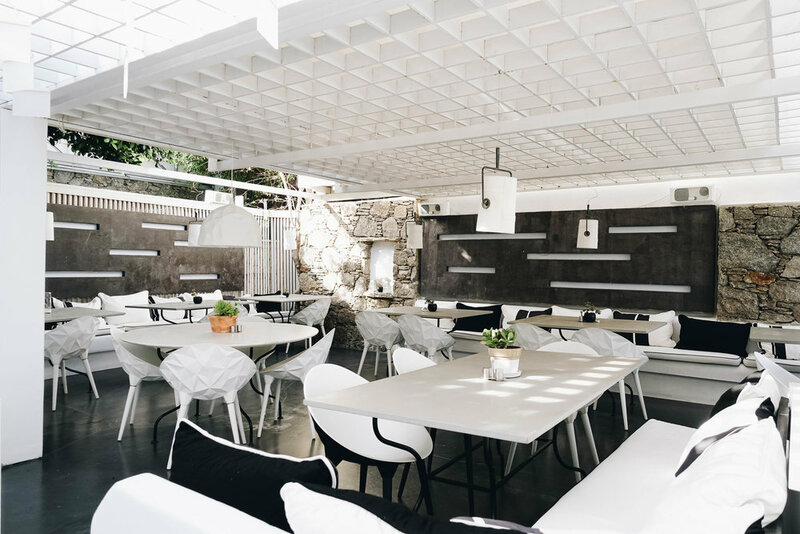 My friend Stephanie and I booked a last minute trip to the Greek islands for our birthdays and we settled on spending our short time in Mykonos and Santorini, with Mykonos being the first stop. Now, when I say last minute, I really mean last minute. Like, we didn't even have our hotel booked until about a week before we were leaving. I was super overwhelmed because I normally have so much time to prep before a trip, but not this time! We were down to the wire here! In the days before our departure, I learned that Mykonos has different towns/villages around the island that you can choose to stay in. I will be the first to admit my naivety that I thought Mykonos and Santorini were all you had to search for and you would find everything you needed in one place and one area. I was so wrong (and honestly can't believe I thought that to be the case haha)! Each island actually has different towns that you can stay in that give you varying experiences. For example, in Mykonos, you can stay in the main village of Mykonos Town, the beach area near Platys Gialos, or the small village of Ornos (among many others). Each area can give you a different vibe depending on what you're looking for. For example, you can find a quiet, relaxing escape tucked away in the hills, or get down with your bad self at party central on the beach. We decided to stay in Mykonos Town to have a more centrally located accommodation. Since we went in early May, the beaches were likely going to be hit or miss with the weather (it wasn't extremely hot yet), and we wanted to be somewhere that we could easily walk around without any transportation. 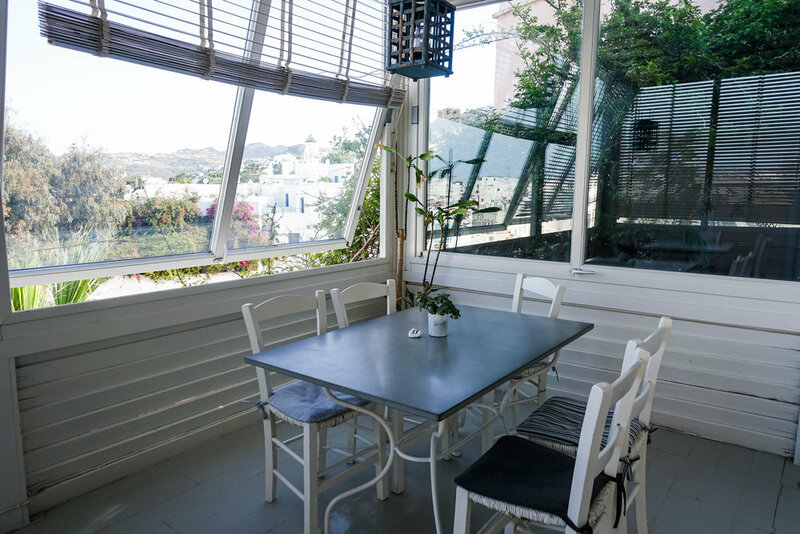 We found a last minute deal at this adorably stylish boutique hotel, Semeli Hotel, that was tucked away in a posh area of Mykonos Town. Getting to Mykonos from Athens was pretty easy since they have daily flights to and from the main land. The flight itself is about 30 minutes and if you book with good time, you can find pretty cheap tickets. There are also direct flights into Mykonos from some of the major European cities, like London, Paris, Rome, Amsterdam, Dublin, and more. You can also take a ferry from Athens, which is cheaper, but it also takes longer (between 2-5 hours). The ferry schedules are also a little inconsistent because of the high/low season availability. In high season, it's more in demand; and in low season, it rarely runs. I would just stick to flying if you can. Once we landed at the airport, our hotel was just a short 10-minute cab ride away. Our driver pulled off the main street, gave us our luggage, and pointed down towards the stairs that led to the bottom of this inclined hill. I'll admit, these stairs looked flat compared to the situation we dealt with at our hotel in Santorini. Once we walked inside, I was practically on sensory overload from all the beauty. Every single nook and cranny was impeccably decorated and just oozed style and sophistication. I was so excited to call this place home for the next few days! In my opinion, one of the most important tasks a hotel designer and decorator has is to make an establishment feel like home for their guests. I mean...think about it: If you feel like you're at home, you're never going to want to leave, right? That's exactly how I felt about Semeli Hotel. I literally never wanted to leave. In fact, I wanted to take every single room and every piece of furniture and decor home with me. It is so stunning! The hotel is cozy and intimate and offers guests beautiful views of Mykonos Town and the surrounding landscape. You're fully immersed in the natural beauty of this island! The decor throughout the hotel is modern and luxurious, but not so luxurious that you feel like you're in your mother's "fancy family room" and can't touch anything. The entire space feels so warm and inviting with plenty of places to hang out and lounge. What's not to love about the bright white walls with pops of color here and there? I especially love the hint of juxtaposition with the seemingly older, traditional Greek building matched with all the hip and trendy furniture. If you've been reading my blog for a while, you know that I'm a big fan of this combo! I'm a sucker for old + new. Similar to the rest of the hotel, the guest rooms and suites come full of their own breathtaking details. Can't you just imagine opening up those French Doors to your balcony and smelling the Mediterranean breeze right outside? That's my dream come true! All of the rooms at Semeli Hotel offer guests beautiful views of the sea, town, pool, or garden. The guest rooms are very comfortable with modern, minimalist decor. There are rooms on the ground levels and upper levels of the hotel (yes, you will have to walk up some stairs, but it's worth it for those views). The garden rooms and lower level suites looked lovely, but I personally prefer being higher up to see everything down below. We opted to stay in one of the double guest rooms that had a sea view, balcony, and private spa. Some of the rooms offer private hot tub spas either inside or outside of the room. All of the rooms had their own flat screen TV, seating area, and stone and marble bathroom. We absolutely loved having this room with the private spa outside, which made for a great place to watch the sunset! The private balcony also has a few lounge chairs so you can relax without fighting for a spot near the pool downstairs. You haven't really been to Greece if you didn't watch a sunset, amirite? Having a private balcony that overlooked the sea made for a perfect place to watch the sunset without all the crowds. Semeli Hotel has plenty of great options for drinking and dining right on site. 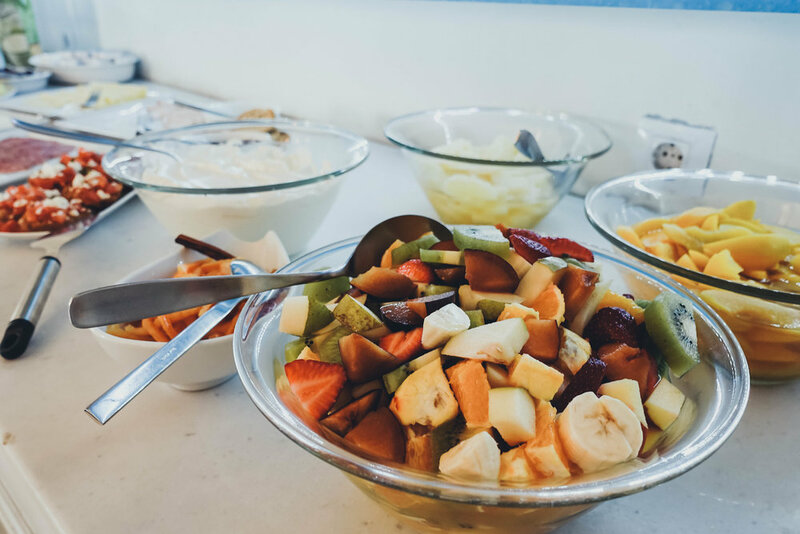 Guests can enjoy a massive breakfast buffet every morning right near the pool in the hotel's main restaurant area. During the day, you can also order drinks, Greek or Italian cuisine a la cart near the pool, indoors, or on the veranda overlooking the sea and garden. The hotel is also home to Thioni Restaurant, which offers guests a luxury fine dining experience. One thing I really, really loved about Semeli Hotel was its proximity to Mykonos Town. The hotel is basically on the beginning edge of the main town, which means you're close enough to get to the main center in less than 10 minutes of walking, but you're far enough that you won't hear the loud music blaring from the nightclubs at 2am. It is the absolute perfect location in my opinion. That being said, if you can manage to move from your chic abode, I highly recommend exploring the town! It's easy to get lost amongst the windy roads and paths of Mykonos Town, but that's where the fun lies. Go shopping, have some dinner by the sea, enjoy a drink in Little Venice, or go clubbing until the wee hours of the night! There's not much else to say than just, "Enjoy yourself!" The pool is so beautiful and offers a gorgeous view of the surrounding landscape. It was pretty low key and quiet while we were there, but I can see this being a place that gets busy during the hot summer months. Semeli Hotel has their own spa and gym on site for guests to enjoy. The gym is pretty small, but offers the basic necessities if you want a quick workout during your stay. Contact the hotel for information on the spa services that they offer, which include a variety of massages, facial and body treatments. We didn't have time for any treatments, but hopefully next time! Currency used in Mykonos (and all of Greece) is the Euro. In good traffic, the airport is about 10 minutes away. You can hire a taxi pretty easily from the airport, or arrange your own transportation ahead of time. Because Mykonos can get very crowded, I recommend getting an early start to see the town—the earlier the better to avoid having hundreds of people in your photos. Plus, the sun won’t be as hot in the early morning so you won’t feel like you’re melting. While I wouldn't always recommend waiting until the last possible minute to find accommodations when traveling internationally, I have to say that this time worked out in our favor! I fell in love with Semeli Hotel and the 5-star experience they provided us. I'm literally still swooning over the magical colors, style, and decor from this hotel! Overall, I think this was a great choice of hotel for its proximity to town, level of hospitality, and general aesthetic. 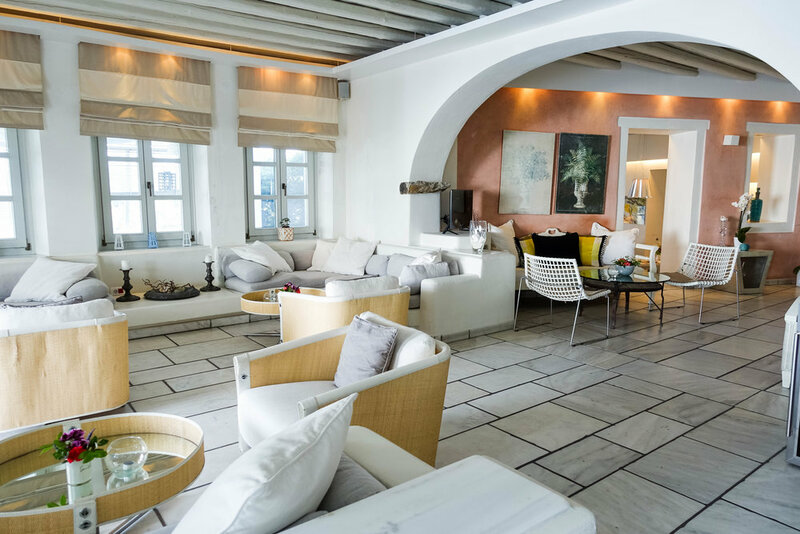 I highly recommend booking here if you're looking for a luxury boutique hotel in Mykonos Town.